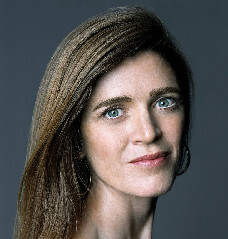 Cass Sunstein and Samantha Power | can i just finish my waffle? Washington’s newest power couple is now. . . a power trio. Superstar academics turned top Obama officials Samantha Power and Cass Sunstein are celebrating today’s birth of Declan Power-Sunstein. Seven pounds, eight ounces, the happy father tells us. Power, 38, is the Harvard foreign-policy scholar whose comments about Hillary Clinton led to her departure from the Obama campaign; she’s now with the National Security Council. Sunstein, 54, is the longtime University of Chicago law professor nominated to head the White House’s Office of Information and Regulatory Affairs. They met on the Obama campaign, married in Ireland last summer. They married July 8, 2008. Cass Sunstein has one daughter, Ellyn, through his first wife, Lisa Ruddick. Ellyn is rumored to be the Obama Troll called Ellie Light. Or maybe it was Samantha herself…..
Martha Nussbaum, Professor, University of Chicago, was Cass Sunstein’s partner before Samantha came into the picture, although the picture may have blurred a bit as to when Martha went out and Samantha came in. “Animal Rights: Current Debates and New Directions,” is a book that Sunstein co-edited with then-girlfriend Martha Nussbaum. In that book, Sunstein set out an ambitious plan to give animals the legal “right” to file lawsuits..
Posted: 03.25.11 Updated: 03.26.11 @2:27p.m.